Several hundred jobs are to be cut by Spain’s second biggest airline in an attempt to streamline operations in the Canaries due to the economic crisis. 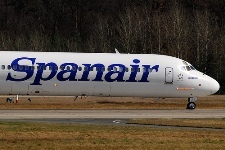 In the coming months Spanair is to shut down several bases outside Madrid and Barcelona. Tenerife and Gran Canaria are included on the cuts list. Up to 350 jobs may be affected but unions believe the figure may be as high as 490 direct posts and over one thousand indirect ones. An official request for the redundancies has been filed with the Department of Employment by the airline.